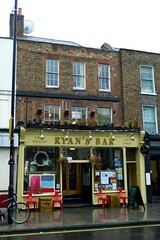 A pub/bar in Stoke Newington, closer to the Clissold Park end of Church Street. There are three handpulls for ale at the bar, though the ale quality has been variable on Ewan's visits. They also have a couple of Meantime keg beers (Pale Ale and London Lager). There's a downstairs function room with sofas that puts on events and is perfectly pleasant. It puts on live music (including contemporary jazz), comedy, and has a long garden. Irish-owned and therefore friendly - [dhyandeva]? reports always getting into a conversation at the bar. Ewan's verdict: I have only visited for a friend's club evening. However, if the bar is Irish-owned, it certainly plays down a lot of the 'Oirishness' you can sometimes get in other Irish pubs. It has a pleasant atmosphere of a busy weekend evening, and a decent range of drinks available. Last visited by Ewan, Kat and others, August 2012. Last edited 2013-05-10 07:59:35 (version 17; diff). List all versions. Page last edited 2013-05-10 07:59:35 (version 17).